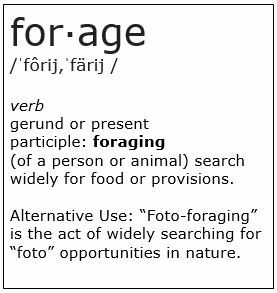 Years of foraging for photos while enjoying nature has produced thousands of images in my reference library. 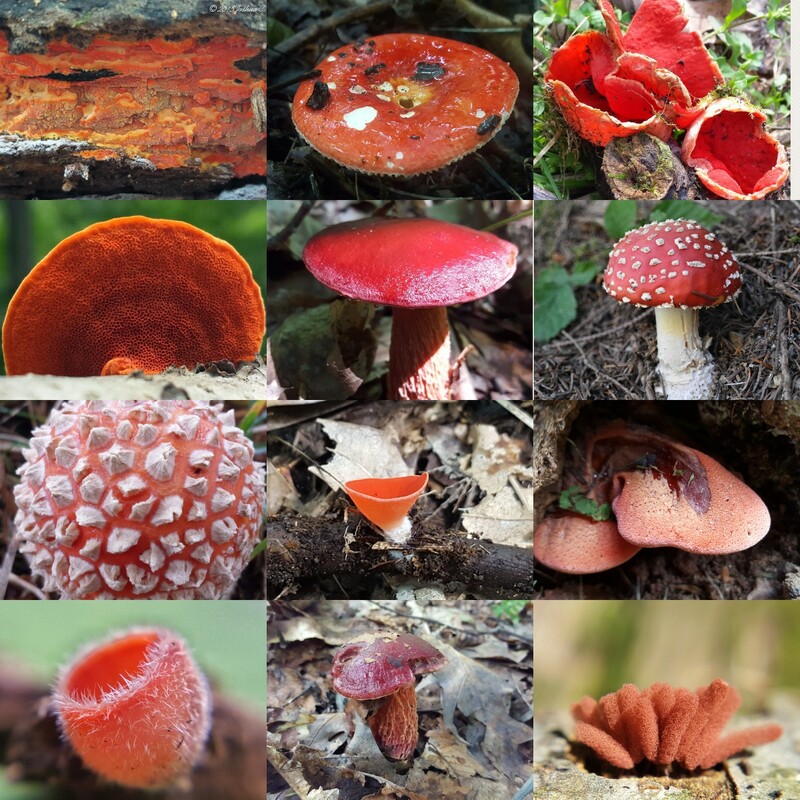 It’s cold and crispy outside with few mushrooms to be found, so I gathered 72 of my most colorful memories into this collage. The missing color – blue – is on my list to discover during this year. Unless otherwise noted these were photographed in Western Pennsylvania and Eastern Ohio. (From left to right, top to bottom) Phlebia coccineofulva, Russula sp., Sarcoscypha dudleyi/austriaca/coccinea, Trametes cinnabarina, Butyriboletus frostii, Amanita muscaria (Estaing, France), Amanita muscaria var. muscaria (Travemünde, Germany), Sarcoscypha occidentalis, Fistulina hepatica, Microstoma floccosum, Butyriboletus frostii, Arcyria denudata (slime mold). (From left to right, top to bottom) Omphalotus illudens, Calocera viscosa – possible ID (Hofoldinger Forest, Germany), Amanita muscaria var. 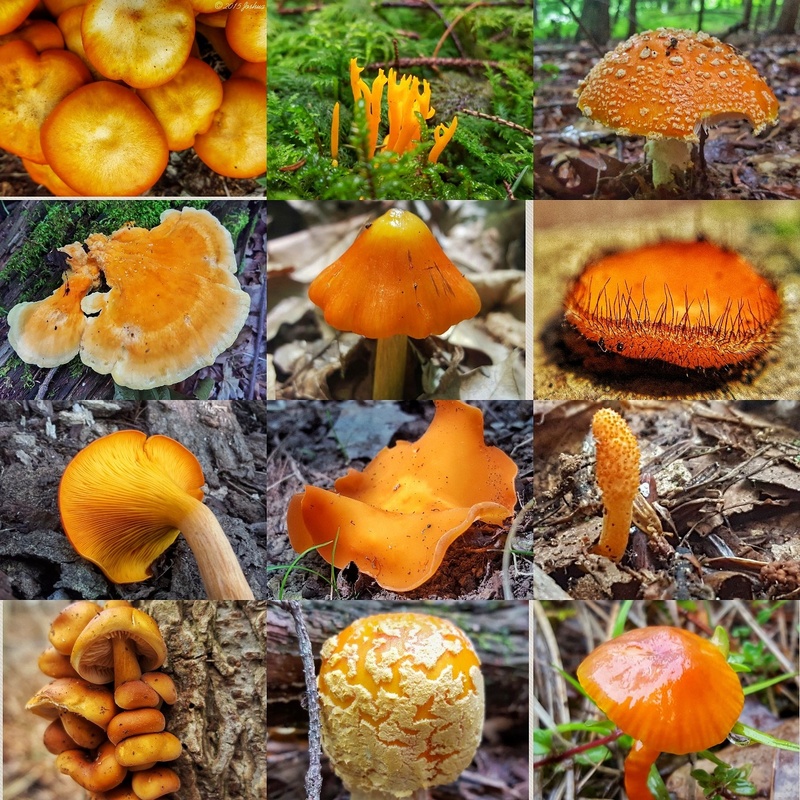 guessowii/persicina, Laetiporus sulphureus, Hygrocybe conica, Scutellinia scutellata, Omphalotus illudens, Aleuria aurantia, Cordyceps militaris, Flammulina velutipes, Amanita muscaria var. guessowii, Hygrocybe miniata (Mittenwald, Germany). 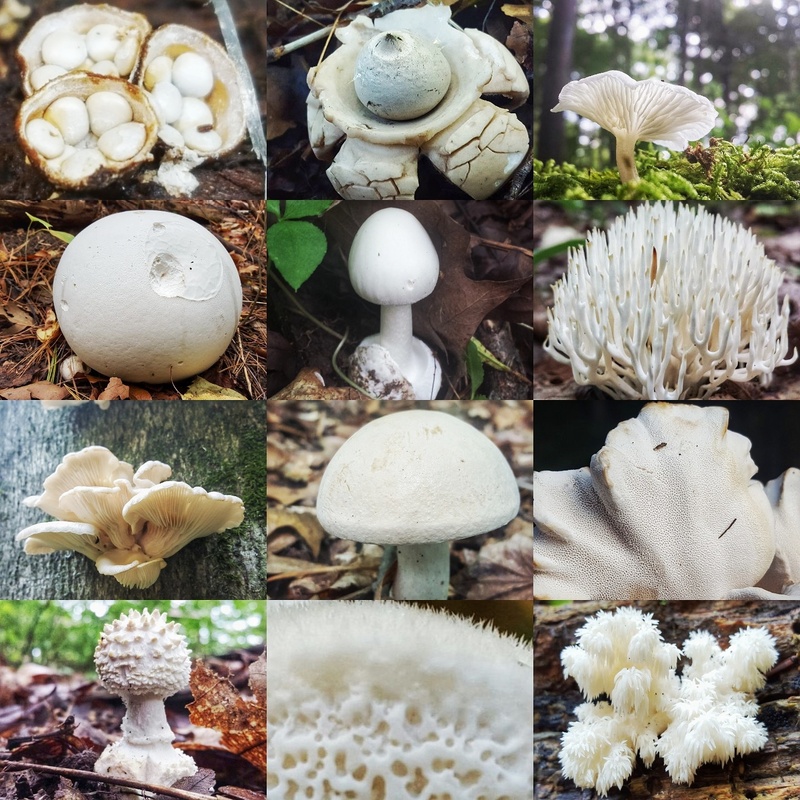 (From left to right, top to bottom) Crucibulum laeve, Geastrum triplex (Munich, Germany), Clitocybe sp., Calvatia gigantea, Amanita bisporigera, Ramariopsis kunzei, Pleurotus ostreatus, Boletus pallidus, Grifola frondosa, Amanita abrupta, Trechispora sp., Hericium americanum. 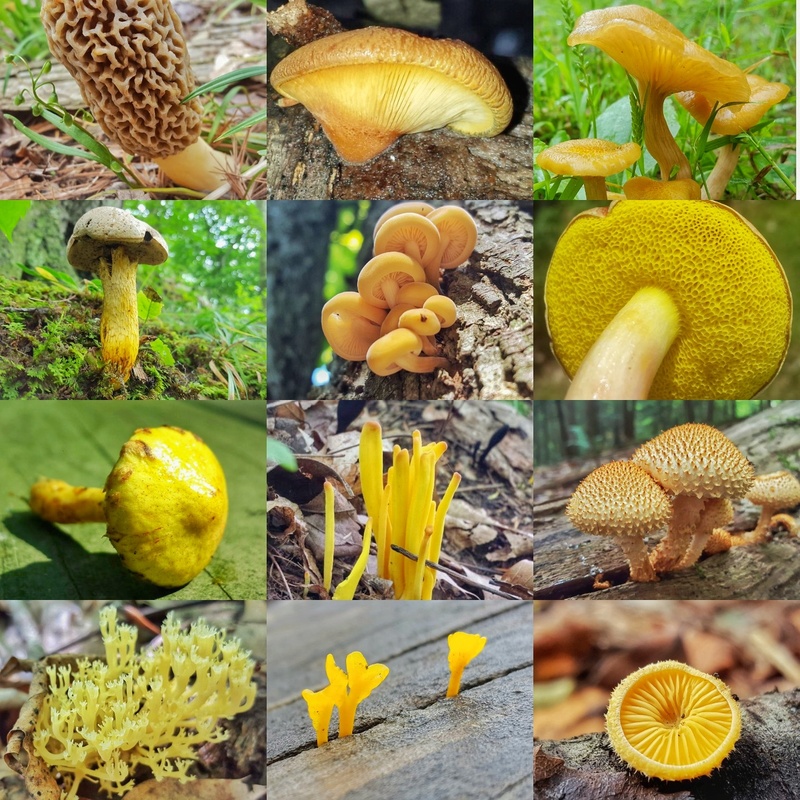 (From left to right, top to bottom) Morchella americana, Panellus serotinus, Armillaria tabescens, Retiboletus ornatipes, Flammulina velutipes, Aureoboletus auriporus, Suillus americanus, Clavulinopsis fusiformis, Pholiota squarrosoides, Artomyces pyxidatus, Dacryopinax spathularia, Phyllotopsis nidulans. 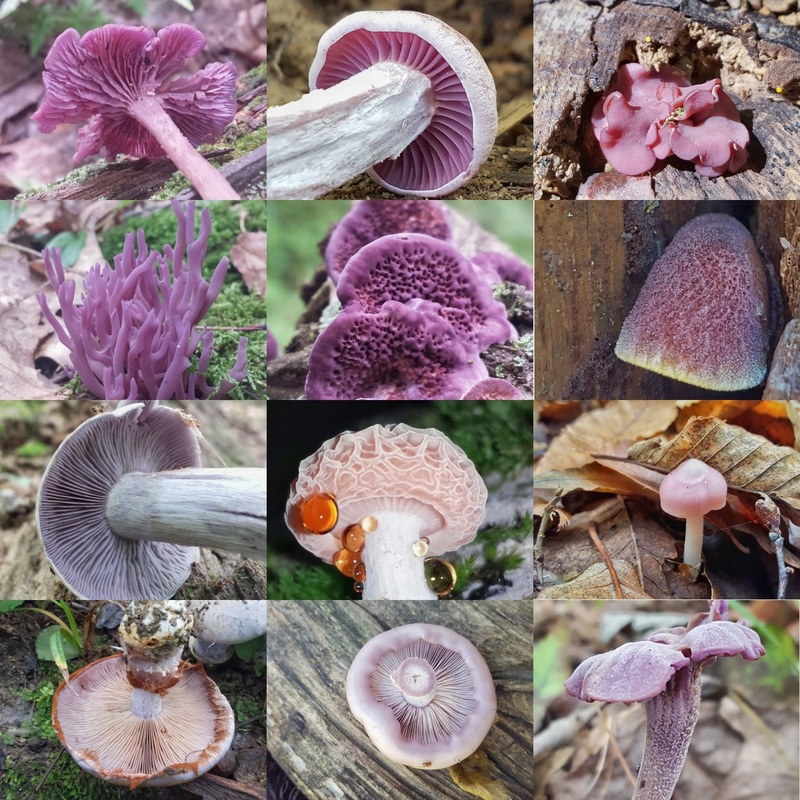 (From left to right, top to bottom) Laccaria amethystina, Laccaria ochropurpurea, Ascocoryne sarcoides, Clavaria zollingeri, Trichaptum biforme, Tricholomopsis rutilans, Laccaria ochropurpurea, Rhodotus palmatus, Mycena rosea (Borgotaro, Italy), Cortinarius iodes, Lepista nuda, Laccaria amethystina. OH my goodness! What a stunning collection! True eye candy! You blog is beautiful! It is my favorite place to be! Have just looked at two of your recent posts, this beauty, and one of a collage of the gill patterns of different fungi. Lovely photos, lovely blog! I will be looking at more of your previous posts. 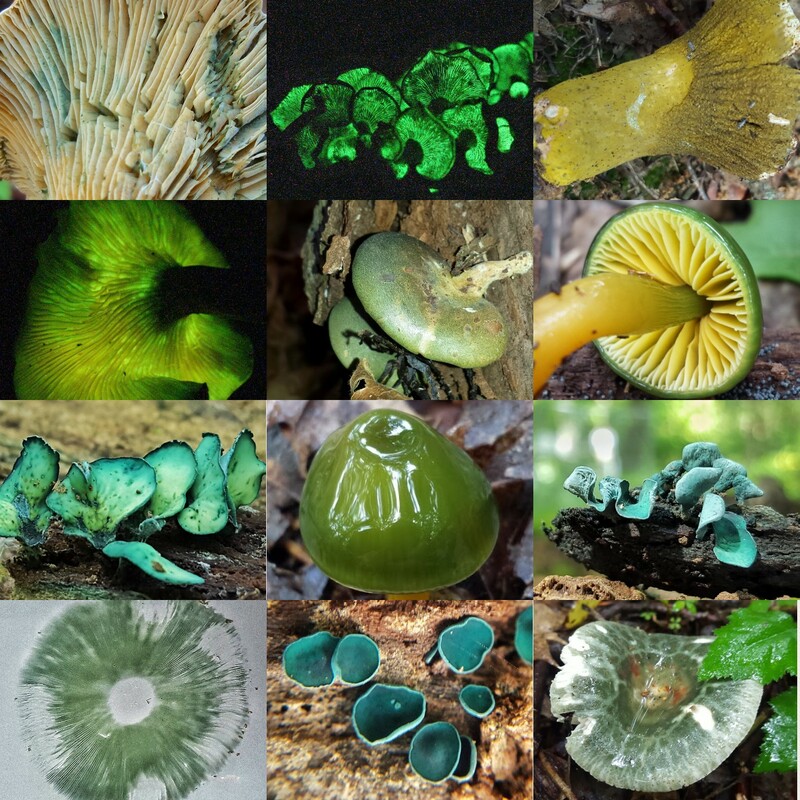 Thank you for liking mine about foraging for wild mushrooms.